Crankshaft positioning tool – Jaguar No.303-645/303-531. Crankshaft pulley locking tool – Jaguar No.303-191/18G 1437. Crankshaft pulley locking tool adapter – Jaguar No.303-191-02/18G 1437-2. Disconnect battery earth lead.NOTE: On XK8/R models: Open both doors before disconnecting the battery to allow the windows to open slightly. If fitted: Remove camshaft position actuators  and carriers  from cylinder heads. Remove RH timing chain tensioner  , blade  and guide  . 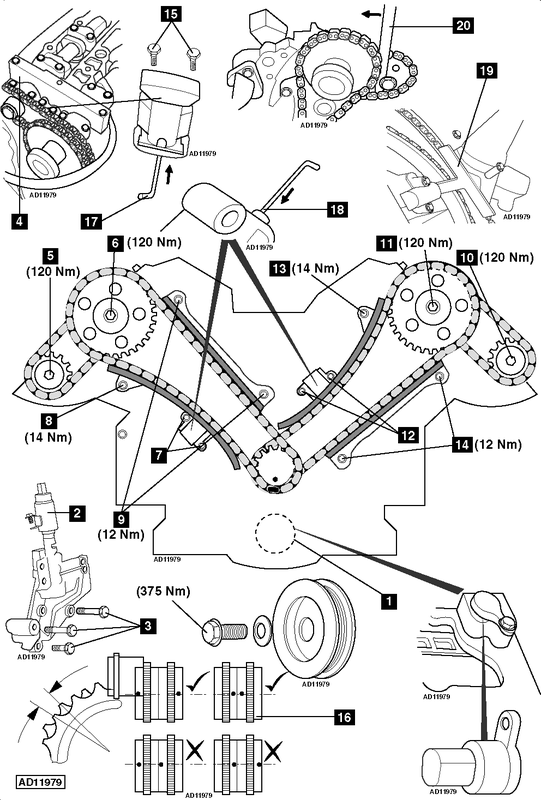 Remove RH timing chains and sprockets. Remove LH timing chain tensioner  , blade  and guide  . Remove LH timing chains and sprockets. Remove camshaft coupling chain tensioners  . Insert a thin wire to release the check valves  &  . Using hand pressure only, compress the tensioners. Fit LH timing chain. Do not tighten bolts. Fit LH timing chain tensioner  , blade  and guide  . NOTE: Ensure that the oil gallery blanking plate is installed correctly. Fit one or two primary chain wedges to take up slack  . Using the timing chain tensioning tool, tension the LH exhaust sprocket anti-clockwise  . Tighten LH exhaust camshaft sprocket bolt  . Tighten LH intake camshaft sprocket bolt  . Remove primary chain wedges  . Remove LH camshafts setting/locking tool  . Fit RH timing chain. Do not tighten bolts. Fit RH timing chain tensioner  , blade  and guide  . Using the timing chain tensioning tool, tension the RH exhaust sprocket anti-clockwise  . Tighten RH exhaust camshaft sprocket bolt  . Tighten RH intake camshaft sprocket bolt  . Fit crankshaft vibration damper. Use new bolt.